Oakhurst Farm offers a healthy slice of rural bliss for the entire family. 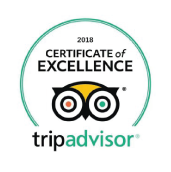 From stylish and comfortable accommodation options to plenty of good ol’ fashioned farm fun for the kids and adults alike. A visit here will remain a family memory for years to come. 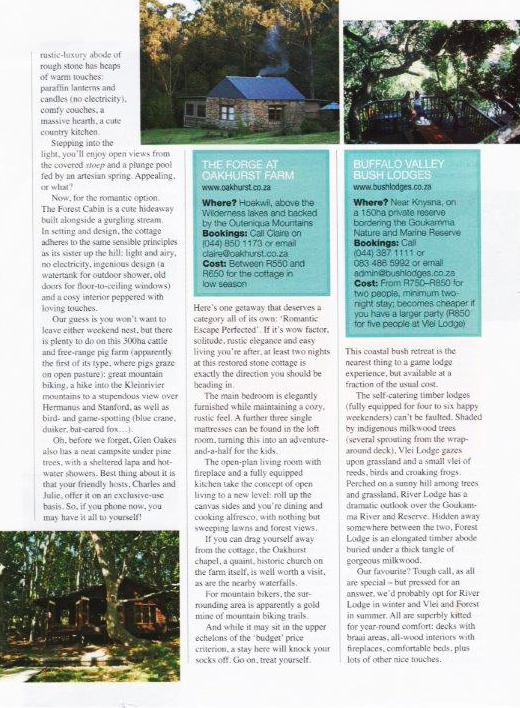 For couples, The Forge, a gorgeously restored and converted stone blacksmith’s forge, offers a unique combination of rustic luxury, while the Farm Cottages are ideal for families or groups looking for that perfect spot right on the forest fringe. Whatever your choice, be it hiking trails to the waterfalls, fishing on the dam or cycling on the many kilometers of forest single track, this is a farm stay like no other, the kind of place you and your kids will never want to leave. We spent 5 amazing days at Oakhurst and we were very sad to leave! We loved the beautiful cottage with it's gorgeous deck - kids rode bikes all over the farm and we made it a daily ritual to walk through the forest every day! You’re spoilt for choice at Oakhurst. From the historic Forge, one of the very first buildings on the farm, to the beautifully restored and fun-filled Farm Cottages. All of Oakhurst’s accommodation comes with oodles of personal touches, extra comforts and a great spread of farm activities. Here it’s all about comfort, relaxation and if you’re up for it, getting stuck into the Oakhurst action. All Oakhurst accommodation now has free WiFi. A combination of wow factor, rustic country elegance and romantic charm second-to-none, has made The Forge at Oakhurst a top retreat for anyone looking for a little piece and quiet. Sleeping four, with two additional beds for kids in a loft area, this 150 year old stone cottage was one of the first building to be built at Oakhurst and today is the main bedroom, with thick stone walls and exposed timber beams. The living area wraps around the cottage and is made up of a dining area, equipped kitchen with gas stove and cosy lounge area. The living area opens out via glass doors onto a lovely covered deck with soothing views onto open fields and forests. The Forge has two bathrooms, one being wheelchair friendly. There is also a secluded, open-air hot shower. Firewood, percale linen, bath towels and soaps and WiFi are included with your stay. Our Farm Cottages have been a part of Oakhurst for the past 30 years. Kween’s Kaya, Awies Attic, Leenies Lair, Hans’s Hollow and Nick’s Nook are set along the edge of a section of forest, intersected with a gurgling stream that flows during the rainy periods. Each cottage is privately positioned and fully set up for self-catering, with a well equipped kitchen and cozy living area with wooden floors. The living area in turn opens out onto a large wooden deck and braai area. This is the spot where you can either enjoy a good meal around the large wooden table or simply enjoy some of Oakhurst’s fine mountain air while getting stuck into a good book. Each cottage has three bedrooms (One double and two twins) and sleeps up to 6 people. There is a central bathroom with shower. Garden Route winters can be cold, and a fire roaring in the kitchen’s wood-burning stove sets the perfect atmosphere for farm winters. Once the school to Oakhurst’s farm children, this building has been lovingly restored and converted into four charactar-packed, fully equipped units, each with a double and twin bedroom. The long school building houses three of these units, namely Landon’s Loft, Holly’s Hangout and Anna’s Apartment. The latter two are ideal for larger groups sharing, as they include inter-leading doors between each unit. All have independent braai areas (wood included), patio’s, kitchenettes and a bathroom with shower. Set away from the main building is Isak’s Eden, the fourth unit which also has separate double and twin rooms, a kitchenette, private patio and braai area and equal amounts of rustic Oakhurst charm. Just like the rest of our farm accommodation, The Schoolyard puts you right in the centre of the action, and within walking distance (500m) of the children’s play area, the farm dam and the swimming reservoir. With those gorgeous rural views and fresh country air, there’s plenty of reason to get out and explore. 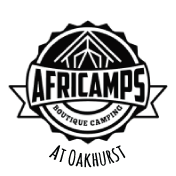 Africamps now has eight beautiful canvas tents set up at Oakhurst. Overlook rolling green fields and the Outeniqua Mountains beyond, the tents are tucked away along the banks of one of the farm dams, a spot you’ll fall in love with! At Oakhurst there is no shortage of healthy outdoor fun to keep you and your kids busy. The tents are situated next to one of three farm dams. Try your luck at a spot of fishing or take out one of the canoes. Kilometres of well-maintained single track through the forest is ideal for mountain biking or trail running and the farm’s majestic waterfall makes for an adventurous forest hike. The kids can visit Oakhurst Dairy to watch cows being milked and calves being fed either early morning or afternoon. Each tent sleeps 5 and has two queen beds and a single bunk bed. The tents are fully equipped with everything you need, including a lovely deck and braai area. At Oakhurst there is no shortage of healthy outdoor fun to keep you and your kids busy. From many kilometres of well-maintained forest single track for mountain biking or trail running, to hikes through the forest to the farm’s waterfall, the action at Oakhurst just keeps getting better. Try your luck at a spot of fishing in the farm dam, where canoes are ready and waiting for you. The kids can visit the Oakhurst Dairy and watch the cows being milked or play on the climbing wall and jungle-gym in front of the cottages. There’s no doubt about it, at Oakhurst the action never stops. Oakhurst now has 16 km of pristine forest single track, designed with mountain bikers, trails runners and kids in mind. Whether you’re an avid mountain biker looking for a challenging ride or just want to get out into the forest with the kids in tow, you’re spoilt for choice on our well marked routes. There are a number of short walks and hikes on the farm, the most popular one running down the Klein Keurbooms river to the spectacular waterfalls. For cycling and trail running groups, Oakhurst is ideally suited as a central base from which to run training camps. Beautiful surroundings, quality accommodation and easy access to challenging and varied training grounds. A visit to Oakhurst Farm isn’t complete without a horse riding trail. We provide helmets and all tack, while our careful and considerate guides will help you and Oakhurst’s gentle steeds along…every step of the way. PETITE PONIES: This short, easy ride is designed specifically for young children. Our guide will lead the horses on this trail and include some time for the kids to feed the horses afterwards. FOREST, FIELD & FARM: Suited to riders aged 8+, the trail cuts through forest, fields and different vantage points. It has an interactive element, with your guide pointing out bird and plant life along the way. PONY EXPRESS: This innovative outride sees our trail guide coming to you! He’ll visit your unit, no matter where you are on the farm, and see if you or anyone in your party is up for a quick outride. Oakhurst Farm is located along the well-know Seven Passes Road, which runs inland between George and Knysna. Apart the exhilarating single track on the farm itself, there are a number of running and MTB trails nearby, either heading inland towards the Outeniqua Mountains or into indigenous forest areas. Many of these can be taken on as self-guided trails. There is almost no end to the variety of riding and running available in the nearby surroundings. Better still, your bike will barely touch tar. Simply described as sheer bliss for kids, Oakhurst is the kind of place your kids will never want to leave. From watching the dairy cows going to milk to venturing off on their bikes along farm roads and forest trails, kids are guaranteed some serious farm fun. The Crow’s Nest, a platform built into the trees, The Climbing Wall and Slide are all on the forest fringe in front of the cottages, allowing you to keep a watchful eye. So, abandon the iPads, put on the gumboots and let them play like kids did back in the good ol’ days. The Climbing Wall and Slide are tucked away on the edge of the forest in front of The Cottages. The climbing wall offers an exciting challenge for all kids, while The Crows Nest is a large platform built into the trees, with a slide attached for an action packed descent. With all this within easy reach of your accommodation, all you’ll need to do is run down to call them back for supper! It’s all about the outdoors at Oakhurst, kids can run wild and experience life on a large dairy farm, not to mention the farm walks, fishing on the dam or bike trails just ready and waiting for them. So bring the bikes, fishing rods and plenty of sunscreen, at Oakhurst there more than enough to keep them running wild for the duration of your stay. Oakhurst is a working dairy farm and accompanied kids are welcome to come and watch the cows being milked at the Oakhurst Dairy. Here the Oakhurst staff will explain the process to them and offer them an insight into where their milk comes from and how it reaches the breakfast table each morning. Our farm shop is well stocked with unique treats, farm produce and kids toys to make your stay at Oakhurst even more fun. We’re proud to offer our guests a real taste of the farm with a collection of fresh produce for sale. These products come straight from the farm and include our famous Jersey milk; free range eggs, chicken and beef; and homemade yoghurt as well as ready-to-cook breakfast and braai (barbecue) baskets (kids’ options available) that we personally make up, right here at Oakhurst. Don’t feel like cooking? We’ve got you covered too! Our store also boasts an extensive selection of readymade meals that you simply need to pop in the oven, heat and eat, as well as pre-order picnic baskets. That means less time in the kitchen, and more time soaking up the joys of farm life! The Oakhurst Farm Shop is also jam-packed with handmade treats, toys, collectibles and even a few farm-inspired décor items that allow you to take a little piece of the beautiful Garden Route home with you. You can order your breakfast and braai baskets, picnic hamper and readymade meals when booking your stay, or once you have arrived at Oakhurst. To ensure our guests get to enjoy the complete South African farm experience, we’re proud to offer our exclusive Sunrise Breakfast Baskets, hand selected and prepared especially for Oakhurst guests. These hearty baskets of joy include muesli, muffins, rusks and yoghurt, all homemade at Oakhurst. The yoghurt is produced from Oakhurst’s famous Jersey milk, and the rusks are made by our Nanna according to her age-old recipe. Also on the menu are free range eggs from our coop; bacon from pasture-fed pigs from Knysna; fresh, seasonal fruit; butter and jam. To round it all off, we’ve included freshly ground coffee, a bottle of Oakhurst Jersey milk, and fresh juice. No South African holiday is complete without a traditional braai (barbecue), which is why we’re delighted to offer guests our exclusive Great Griller Braai Basket. These bountiful baskets feature a selection of first grade South African meat (around 400g); a ready-to-cook braai potato in foil with garlic butter; a braai bread (garlic roll in foil or stokbrood – bread on a stick, or roosterkoek – grill breads); 2 freshly prepared salads; and dessert (chocolate treats or marshmallows on a stick for roasting). Our pre-order picnic baskets are made up by the Wilderness Picnic Company, and are delivered to your door, ready to enjoy at your convenience. Oakhurst Farm is one of the few remaining, large working farms along the Garden Route. Covering some 640 hectares, 200 of which are pristine fynbos and indigenous forest, the farm is today run commercially by the Crowther family, sixth generation descendants of the original purchaser, Henry Dumbleton. Dumbleton bought the farm without laying eyes on it, while serving in the British Army in India in 1820. It was not until 20 years later that he sent his son, Henry Dumbleton Junior out to this wild and remote part of the Cape to develop the farm. Henry built The Forge (today used as one of our accommodation options) and the original farmhouse, before choosing to move to the genteel surrounds of Cape Town. His brother Walter Dumbleton arrived in 1860 and took the farm to the next level, with the development of a 4.5km water furrow from the Outeniqua Mountains to the new farmhouse, which he built in 1868 to accommodate his wife and 13 children. This home is still used at the main farmhouse today. In the mid 1870’s he built the Oakhurst Chapel, which still serves the local community and is a popular wedding venue. Next he built a school, followed by a water mill, which was still in use up until the 1960’s and is fully intact today. As a top dairy and beef farm in the Southern Cape, Oakhurst Farm’s rich history and spectacular beauty draw visitors form across the globe. From the N2 between George and Sedgefield: Take the HOEKWIL turnoff, which leaves the N2. Follow this road and bypass Hoekwil village to continue for 7.2km to the farm gate. Having turned right off the tar, continue for 2.4km on gravel to reach the sign posted junction to the Farm Cottages and The Forge. Please note: There is limited cell phone signal at the main farm house and The Forge. Our manager Wilna Vorster can be reached via What’s App or via SMS 064 384 1266 or contact Claire Crowther on 082 461 7669. Please note: We have a strict cancellation policy to protect us against cancellations. We are a small establishment and cannot make up business lost. We also have a live calendar with Nightsbridge which connects to many websites around the world giving instant online availability. Once a room is booked it is no longer available to sell on these websites. If cancelled for whatever reason you will be liable for full payment whether we have a deposit from you or not. Verbal and e-mail bookings are binding as a confirmation of the booking. The farm dogs: The farm has five delightful dogs which are part of the Oakhurst family. The dogs live at the main farmhouse, some distance from the accommodation, but do from time to time visit our guests. Please don’t hesitate to let us know if they bother you in any way. From R1350.00 per night for the The Forge. Firewood is available at R30 per bag. Our accommodation is serviced weekly. If you would like cleaning services on weekends, these can be arranged at R250 per cottage. From R1650.00 per night for the cottage. From R1350.00 per night for the cottage. From R1090.00 per night for a tent. Firewood is available at R30 per bag. Our accommodation is serviced weekly. If you would like cleaning services on weekends, these can be arranged at R250 per cottage. 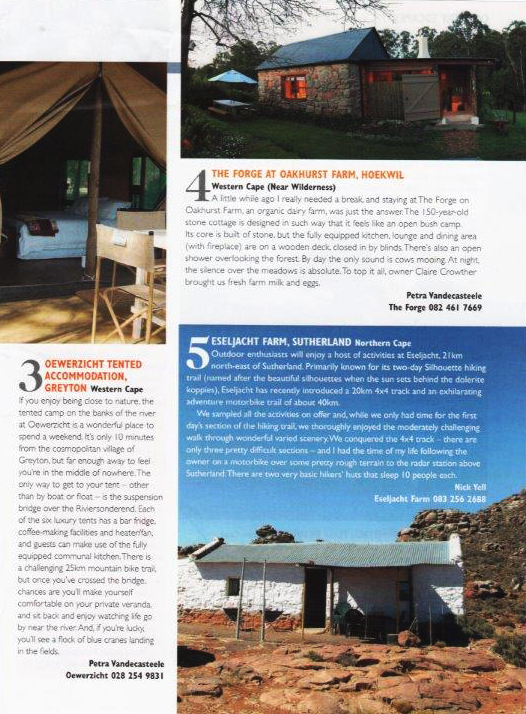 Oakhurst Farm Cottage is an Afristay Valued Member.